Cibulkova d. Halep in 3 sets – This *could* be a great final but I thought the semi-finals would be good and look what happened… i’m going for Domi. Sorry for no preview, i’ve had a busy couple of days… I’ll be back to preview Rome on Sunday. Gavrilova d. Chirico in 2 sets – Gavrilova has said that she likes to play big hitters and this *could* be a decent match-up for her… they’ve never played before and this is Chirico’s best result on the WTA tour by quite some distance. Gavrilova may feel the pressure, but she’s handled everything remarkably well so far. Halep d. Begu in 3 sets – I could see Begu winning this one! But despite the craziness of the week, i’m not brave enough. Halep and pressure are never a match made in heaven but she’s floated through the draw in serene fashion so far. Pavlyuchenkova d. Cibulkova in 3 sets – I say Pavs… so Domi’s winning! 😛 Seriously, this one is too close to call. Azarenka d. Chirico in 2 sets or ret. – I wouldn’t be surprised if Azarenka pulls out of the tournament with the foot injury. She’s been so cautious with injuries this year and rightfully so. If she does play, I feel it would be a good match-up for Azarenka. Halep d. Bacsinszky in 2 sets – I will be seriously impressed if Bacsinszky wins this one. Just a feeling this might be one match too many for Timea. McHale d. Begu in 3 sets – Hmmm if Begu plays like she did against Muguruza then she wins this. Leaning towards McHale though. Suárez Navarro-Stosur – Stosur could get another walkover here! Carla pulled out of doubles on Tuesday with breathing problems. Fit and healthy, i’d go Carla in three but who knows. Keys d. Tig in 2 sets – Keys has done a decent job in the last year at winning these kinds of matches when her draw opens up. Tig had a valuable day off but has still had a taxing week. Halep d. Knapp in 2 sets – Halep last played Knapp in the first round of the Australian Open in 2015 and won comfortably. Don’t see any issues with this one although Knapp can hit a mean ball. Suárez Navarro d. Lisicki in 2 sets – CSN won their two previous encounters in three sets. Lisicki had a good win over Puig in the first round, but I like the way CSN has been playing of late. Lisicki hasn’t really been consistent enough to suggest she can take down CSN on clay. Cirstea d. Kovinic in 3 sets – Cannot believe this is the night match… Cirstea won easy in Rio earlier this year but Kovinic has been in excellent form this last month or so. Should be a tight one, sticking with Cirstea. Siegemund d. Lucic-Baroni in 2 sets – Siegemund won back in Charleston… not sure about her leg, which was strapped against Kuznetsova. Also, she pulled out of doubles with dizziness. Could therefore favour MLB if this goes the distance. Bacsinszky d. Makarova in 2 sets – Timea could be tired but if she’s recovered well, I think she can win this match. Kvitova d. Vesnina in 3 sets – Surprisingly, this is a first career match-up. I’m really pro-Vesnina at the moment and she’s been playing well and won so many matches which will give her a wealth of confidence. 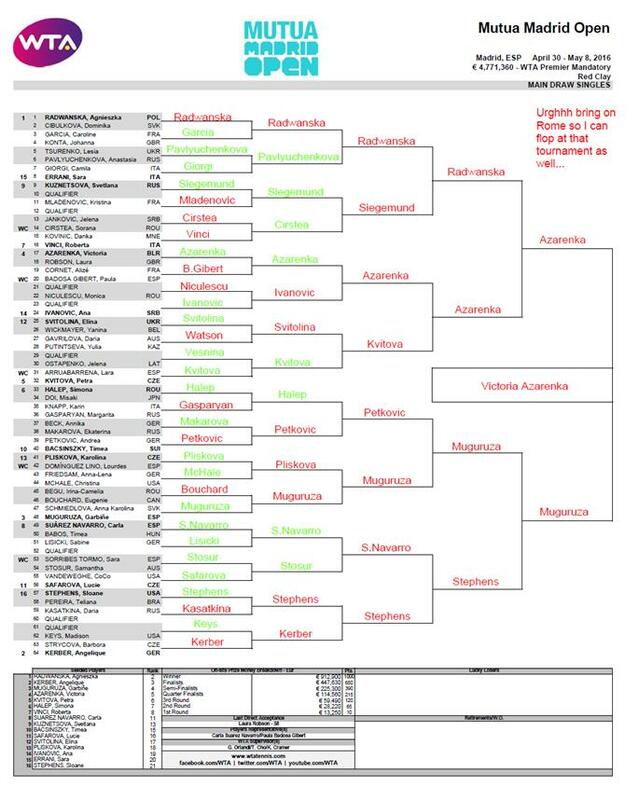 I’m still leaning towards Kvitova but i’d expect Vesnina to get at least a set. Azarenka d. Cornet in 2 sets – Cornet was a tad fortunate in her first round match, benefiting from a retirement by Badosa Gibert. I don’t think Cornet’s quite at the level yet (after the back injury) to compete hard with Azarenka. Muguruza d. Begu in 2 sets – If Begu serves well, i’d expect this to go the distance. Muguruza was a tad shaky in her first round match but that one match in the Manolo Santana court should hopefully have settled her. Begu was struggling with blisters on her foot against Bouchard requiring a medical time-out in the third set. Pliskova d. McHale in 2 sets – Pliskova was unstoppable in her first round match against LDL. This will be tougher because McHale has had a good year. Leaning between two and three sets as you never quite know how focused Pliskova will come out. Strycova d. Keys in 3 sets – Impressed that Keys turned her match around against Riske, I think Strycova has all the tools to frustrate the hell out of her! I think the conditions suit Keys but not sure she’s got confidence on the clay to believe she can go far. Stephens d. Tig in 2 sets – Tig played some really positive, attacking tennis against Kasatkina, but I do question how much energy she has left. Stephens can go on random walkabouts, but her first rounder should have focused her. Svitolina d. Gavrilova in 3 sets – Tempted to go for Gavrilova, particularly after what happened at the Hopman Cup where Gavrilova won, 6-4 7-6(6), saving a string of set points in the second set tiebreak. Gavrilova’s results have improved, but if this is tight and goes the distance, i’d have more faith in Svitolina holding her nerve. Could be a really compelling clash. Suárez Navarro d. Babos in 3 sets – A tough first round match for Carla but despite Babos’s excellent form this year, the best players have found a way past her this year and managed to exploit her weaknesses. Muguruza d. Schmiedlova in 2 sets – There’s the chance that playing a higher calibre opponent might give Schmiedlova a jumpstart… I really hope it does, but I only see one result here. Halep d. Doi in 3 sets – Who knows with Halep, I think she will be vulnerable, but I just cannot see Doi holding her nerve for long enough to get the upset win! Kvitova d. Arruabarrena in 3 sets – Could see Arruabarrena getting a set, but Kvitova should have be strong enough to prevail. Vinci d. Kovinic in 3 sets – Considered the upset with this one, Kovinic is definitely good enough, but can become error-prone, particularly in the last couple of matches i’ve watched of hers. Vinci has been trolling me all year in predictions so Kovinic is bound to win! Kerber d. Strycova in 2 sets – A good match-up for Kerber, i’d fancy straight sets. Ivanovic d. Siniakova in 2 sets – Would expect at least one of the sets to be close, but I think this match-up should favour Ivanovic and it’s a good court for her too. Bouchard d. Begu in 3 sets – A question mark still exists with Bouchard and the abdominal injury and Begu is more than capable of coming through. Siding with Bouchard if it goes to three as I think she is the more resilient player mentally. Pliskova d. Dominguez Lino in 2 sets – On a pretty speedy court, Pliskova *should* be all over this one. Keys d. Riske in 2 sets – Their last match in Beijing went the distance but I feel like a fit and healthy Keys wins this in straights. Cirstea d. Jankovic in 3 sets – Cirstea seems to be on the comeback, while Jankovic hasn’t played since retiring in Miami. The head-to-head is 3-3 so i’m feeling like this is a decent opportunity for Cirstea. Siegemund d. Kuznetsova – Unsure of Kuznetsova’s abdominal injury so i’d take Siegemund coming through. Lisicki d. Puig in 3 sets – Puig didn’t have a day off between Prague and Madrid and while Lisicki is extremely erratic these days, my original thought of Puig has now swung to Lisicki. Stosur d. Sorribes Tormo in 2 sets – Tough turnaround for Sam but a pretty good match-up for her I would say considering the quality of first round matches. Pavlyuchenkova d. Tsurenko in 2 sets – Being bold, going for a first Pavs win since Acapulco! Kasatkina d. Tig in 2 sets – Expect a close two setter as Tig has two matches under her belt, but Kasatkina was on fire in Charleston at winning these sort of matches. Niculescu d. Chirico in 3 sets – Would take an excellent display from Chirico to hit through Niculescu on a consistent basis but the court should help her out. Garcia d. Konta in 3 sets – Very intriguing match, instinct says Garcia. Petkovic d. Bacsinszky in 3 sets – Such a tough turnaround for Timea, i’ll be mega impressed if she wins this. See preview HERE. Watson d. Gavrilova in 3 sets – Gutted Poots-Dasha is no longer a match-up! Vesnina d. Ostapenko in 2 sets – I am pro Vesnina right now and had a qualifier to the quarters in case it was Vesnina (turned out to be MLB eeeek). Mladenovic d. Lucic-Baroni in 3 sets – Their match at Charleston went deeep into a third set tiebreak, with the nature of their games it really could go either way. Gasparyan d. Knapp in 3 sets – A toss up, Gasparyan’s form has dipped a little in the last month. Svitolina d. Wickmayer in 2 sets – Wickmayer will have to produce a very consistent display to upset Svitolina in this match. Giorgi d. Errani in 3 sets – I’m struggling with this one. While we are on clay, Errani’s results in Madrid have never been anything special. However Giorgi hasn’t had a good year and could easily get unstuck by Errani’s variety. Another factor could be that Errani was sidelined from Fed Cup action and Stuttgart by an injury so she will be playing her first match since Charleston. Badosa Gibert d. Cornet in 3 sets – Instinct says the young Spaniard has a good chance in this one with Cornet still coming back from time out with a back injury. Stephens d. Pereira in 2 sets – Stephens always starts slow in tournaments, but this is one of the best draws that she could have got. Makarova d. Beck in 2 sets – Always see Makarova winning in this match-up but could be wrong! McHale d. Friedsam in 3 sets – Both have played well this year, a toss-up. *Urgh… double hate! Not only does Madrid overlap with Prague and Rabat, but the main draw kicks off before qualifying concludes. This always winds me up! I’ve left a lot of gaps because there are some potential qualifiers who I see doing well in the main draw. This makes it a lucky dip with the Draw Challenge which closes before the first main draw match.